Update April 2014: I recently published a review of three independent comparison tests of masks, which includes Totobobo. I’ve often written about how Beijingers may need a good filtration mask on the really bad days here, but it’s difficult to find good ones. I’ve usually recommended any official N95 mask, and I consider the 3M company to be the most professional company for these. Unfortunately, they are much more geared for construction teams and such, and therefore are not very consumer-friendly. They just aren’t cool looking, and it’s a serious hindrance to get people to wear them. Plus, it’s almost impossible to find kids versions. So what’s out there that works, is inexpensive, and passes a teenager’s coolness test? The median (interquartile range) reduction in airborne particle counts was significantly higher [193-fold (145-200)] for N95 masks than for Totobobo masks [135-fold (83-184)] (P<0.05). There was no statistically significant difference between the proportion of subjects achieving a reduction of > or =100-fold between N95 (19/22) and Totobobo (16/22) masks. We conclude that use of the Totobobo mask without fit testing cannot be recommended, but its performance is sufficiently promising to warrant further investigation. Of course this is only one good study, but it’s one study more than many other consumer masks seem to have. I tried it around town for a bit, and the overall comfort is good. It definitely is less awkward-looking than the typical N95 with exhalation valves. I was pleasantly surprised with the seal and that my glasses didn’t fog up, although I got those mask lines on my face that other masks also cause. It’s relatively easy to keep on, with straps either behind the ear or behind the head (which always provides a closer fit). I didn’t do any fancy techinical testing with it, but on a bad, smelly day I put on the mask and instantly could no longer smell that pollution. Totobobo didn’t pay me anything, and I get no income from them for this mention. I’m simply trying to find well-researched options to protect myself and anyone else from Beijing’s air pollution, and I’d be more than happy to review other masks as well and to publish the results. Last year I tried to find good studies on other brands, including Respro, but I found no well-designed studies on other masks. Does anyone have such information? I think Totobobo is a good and affordable option for people. And a 135-fold drop in pollution is very impressive; even on an emergency day with the AQI over 500, the mask would bring your air to WHO-safe levels. Don’t forget that the gold standard remains an N95 mask, which are now available at almost all local markets such as Jenny Lou’s and April Gourmet. It seems that Totobobo currently needs to be ordered from their website and shipped from Singapore. Perhaps the good folks at World Health Store or Beijing Home Delivery could start reselling them here? And in the future, I think some smart entrepeneur should jump on this opportunity and use the proper N95 filters to make a consumer line for kids and adults. It’s not hard at all; just find out whatever Chinese factory is making the filters, and have them print a bunch of sizes, with cool designs and some basic colors. After all, we already know that Beijingers have no problem all winter with colorful kouzhao (口罩) masks — why not make them useful as well? UPDATE: for more information, please read my N95 Masks Buyer’s Guide as well as my air pollution archives. Previous PostGood News: CPR Just Got EasierNext PostDoes Your Child Need The Extra Measles Vaccine? interesting post Richard, I wonder how they stand up to outdoor runs. On days with an AQI of 200 or higher I always wear my N95 3M 8812 for the daily commute by bicycle (bought them in a bulk of 10 on Taobao last year, thanks to your very helpful Blog). I always get strange, even concerned looks from pedestrians when I wear them, I also found that it's absolutely impossible to get a taxi when wearing it, which is very annoying. What’s the mask shown in the picture, please? Just got a RESPRO (Techno model, with a carbon filter) and wore them the last few awful awful days (today is an 8, so not wearing it). I'm on a mission, these masks WILL become fashionable!! Everyone asks me about them. Well, Westerners, anyway. Chinese are used to masks so don't even seem to notice. Keep us posted! I always see Respro as well; I would love to see objective data as to how effective they are. thanks for the great work, do the masks provide protection for both PM 2.5 and PM 10?? Sure they do — most actually work down to PM0.3 or 0.5, which is even smaller. So the “huge” PM10 definitely gets caught and many smaller ultrafine particles also are caught — in ideal conditions, of course. Thanks for all the great information. I gave up driving in Beijing in 2002 because of the traffic jams and have been commuting to work by bike everyday since then. For the last three years I have used the respro mask and have been very pleased with it because it eliminated my cough and scratchy throat. I agree though that I could not find any formal test results online as to the performance of the mask, but it is designed for the increased aerobic activity that sports and cycling entail. I have also been researching the totobobo and after reading your latest posts I think I will purchase some of these for my family and myself. On the matter of appearance, I long ago gave up worrying about how I look and I have embraced the darth vader look of the respro, which in the day time I wear with sunglasses and of course my helmet. In fact with the recent airpocalypse I am getting more and more looks of sympathy and support. It long ago became clear to me that any commute in Beijing within 10 kilometers is going to be faster for me on the bike and the bike is the most environmentally friendly transportation mode known to human kind. Thanks for the reviews of air masks. One thing not really mentioned in your article – do the Totobobo masks have some kind of exhalation valve? I find in my other air mask (N95 but a cheap one), that after a while I can’t really breathe inside, my own exhaled air is just sitting inside…any thoughts? 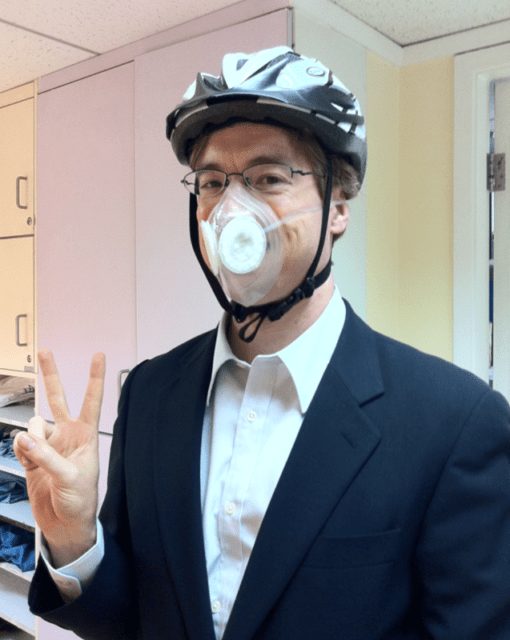 Hi, great article – I’ve had some advice from an allergy company in my home country (UK) that for the kind of “contamination” in Beijing, specifically the volume of PM2.5 particulate, that face masks are not necessarily going to benefit. Their assertion was the masks do not have a filter deep enough to remove the tinniest particles. Therefore as you breath deeper through the mask, it filters out the larger particles but it forces the smaller ones, the ones that do the most damage, further into the lungs. Do you have a perspective on that guidance? I’m not really sure what I can with it other than walk to work in a full hazmat suit 🙂 (I am kidding) or simply avoid going outdoors and breathing deeply on the really bad days. I’m heading to Beijing in a month and I’m newbie to wearing masks. Question: How long will the filter on Totobobo Classic last for a 10-hour outdoor breathing? Also, I went to Totobobo’s wen site and it says one has to buy in $300 worth of masks/filters. Are they really strict about this or one can buy only one mask with a set of filters. Can you recommend another reseller in the US? Keep up the great work and thank you for your help!